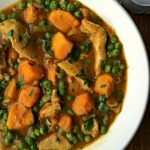 Chicken and Sweet Potato Curry AND it's made in the slow cooker! Add the chicken, onions, sweet potatoes, and bell peppers to the slow cooker. In a small bowl, add all the dried seasonings, garlic and whisk in the chicken broth until the spices are well blended. Add the crushed tomatoes to the spiced broth and mix well. Add the honey and cilantro, and once blended, pour over the chicken and vegetables in the slow cooker. Place the lid and cook on low for 4-6 hours or until the chicken has been cooked through and the sweet potatoes are tender. The last 20 minutes of cooking, add the frozen peas, mix well, replace the lid and allow them to heat through. Garnish with the reserved bit of cilantro. Note: I wanted it slightly thicker, less soupy, so the last hour or so of cooking, I removed the lid to allow the liquid to evaporate a bit. This is a matter of personal choice.